Hot Club of Hulaville will plays its brand of syncopated jazz at Doris Duke Theatre on Saturday. Hot clubs, naturally, are where the cool cats hang out. The phrase has come to signify the syncopated "international" jazz that leaped across the Atlantic in the early '20s -- thanks to black soldiers in the Great War -- and began a funky tango with gypsy and bohemian musical influences in European cabaret. Or we can boil it down to one word -- Django. Time: 7:30 p.m. Saturday; a no-host "gypsyfest" bistro begins at 5:30 p.m.
"Every guitar player, at some point, gets into Django Reinhardt," says Sonny Silva, who began his guitar studies with slack-key master Sonny Chillingworth. "I've always had a fascination with his approach, his scales, his passion, his inventiveness on the instrument. He's not smooth, but he's brilliant." The Parisian gypsy guitarist formed the seminal jazz group Quintette du Hot Club de France in the early '30s -- "Named after the actual club they played in!" Silva said -- and pretty much invented the notion of "lead" guitar, which to that point was mostly used with a band's rhythm section. The phrase "hot club" has since become the secret handshake for le jazz hot enthusiasts around the world. 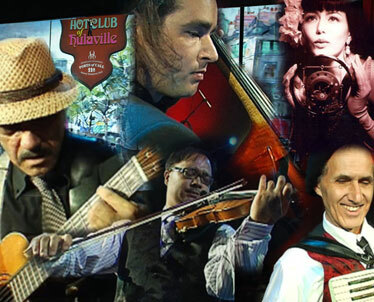 It seem every major city has their own edition, and Silva's is Hot Club of Hulaville, which is playing at Doris Duke Theatre this weekend. "Our violinist is Duane Padilla, who's with the symphony. We were jamming together years ago and said, let's play some hot-club!" Silva said. "Then we picked up Pierre Grill on accordion and piano -- you probably know him from his recording studio, but he's one of the best piano players in the state. He's actually French, too. And there's David Chiorini on concert bass, another symphony guy. Those concert basses, what a sound! "And then there's Willow Chang, singer and -- ahem -- belly dancer. A serendipitous match for us, Willow. She's so good at the theatrical part. She puts the vamp into it, right in the pocket." If ticket sales are any indication, the band is thriving: Every show they've performed has sold out. "Pierre tells me we're becoming more popular," Silva concurred. "The timing is right. Dial in 'hot club' on the Google and you'll find bands everywhere. It's not just jazz. It's not just gypsy. We do have a lot of tunes from the great American song list. "And tango. Lots of tango!"